Skiing is a fun sport and a great way to stay fit. It takes strong core and leg muscles. The problem comes when the skier, whether a novice or pro, doesn’t adequately prepare for the season, or doesn’t pay attention to injuries until it’s too late. As you prepare for another season on the slopes, it’s important to know if your body is ready. The vast majority of each year’s ski injuries occur in the first month of the season, typically at the end of the ski day. Although part of this is environmental when there is just not as much snow to cover all of the hazards in the early part of the season, many of the injuries occur due to lack of body preparation. Skiing requires balance, strength and endurance. It requires adequate thigh and hip strength, along with proper muscle activation and timing patterns to ensure hip and knee stability. Improper strength balances put you at increased risk for anterior knee and lateral thigh pain along with back pain. Poor integration of the entire hip/leg musculature will leave you at a higher risk for knee injuries, including meniscus and ligament tears. You don’t want to spend big bucks on a ski pass and end up missing out on the season because you did not adequately prepare! 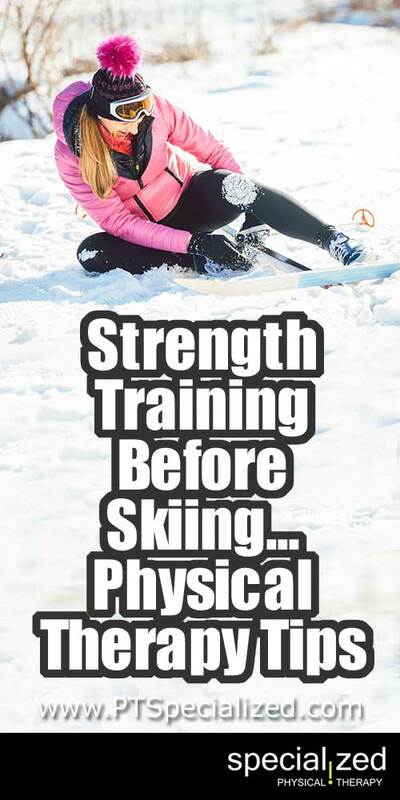 True strength gains take 6-8 weeks of training, so you want to start your preparation now and continue it throughout the ski season to keep yourself on the slopes – and out of the ER!! Don’t blow your whole season. Let us help you get into tip top shape. Then go hit the slopes, knowing they won’t hit back!